V W Broaching specializes in high quality wire EDM machining services for a variety of industries & application. Wire electrical discharge machining is a method of cutting metals and other conductive materials, in which a traveling wire disintegrates material in a controlled manner. The wire is used as an electrode which actually arcs with the part to be cut, thereby creating the desired shape or form. Wire electrical discharge machining is a method of cutting metals, in which a traveling wire disintegrates material in a controlled manner.It uses an electrically charged thin brass wire, which is moved by computer control, close to, but not touching, the part to be cut. The wire and the work piece are either fully submerged, or the part is vigorously flushed with a dielectric liquid. The small gap (anywhere from .0005 to .020 inch) creates a spark, which vaporizes small particles of the work piece as the wire advances. The disintegrated particles are flushed away by dielectric fluid, and the wire is able to advance further. The wire itself is traveling – advancing from a large spool, and after use as an electrode, into a spent wire bin. The travel of the wire is determined by the machine’s computer program. What kind of material can be cut using wire electrical discharge machining? Do I need to pay for special tooling or fixtures when you use Wire EDM to cut my parts? What kind of tolerances can be expected using wire electrical discharge machining? 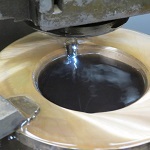 What kind of finishes can you deliver using Wire EDM? Is Wire electrical discharge machining appropriate for production as well as prototype parts? V W Broaching works with a variety of materials for wire EDM machining. Virtually any conductive material can be cut using Wire EDM. This would include all metals, including steel, aluminum, brass, titanium, and alloys and super alloys of all types. The hardness of the material is not a factor. Do I need to pay for special industrial tooling or fixtures when you use Wire EDM to cut my parts? 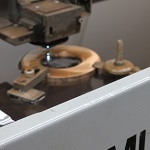 Wire EDM requires no special industrial tooling, and most often requires no special fixtures. The wire EDM operator is a highly skilled technician, who will design the appropriate cutting path from your blueprint, using a CAM program. 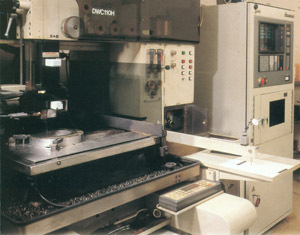 That path is transmitted to the machine for cutting, and in most cases the machine can run largely unattended. 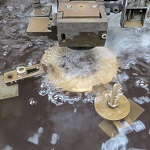 He also employs universal holding fixtures to best position your piece parts in the machine. In some cases, the parts can be stacked, in order to cut multiple parts at the same time. Because a CAM program precisely controls the path of the traveling wire, and the work piece is held constant, extremely tight tolerances can be held. One can expect tolerances within .0005 inches, and down to .0002 inches where required. V W Broaching's Wire EDM finishes are smooth, but matte. Typical surface finishes range between 16 and 64 micro inches, depending on the material. Exceptional finishes, down to RMS 12, can be delivered using multiple passes, where required. 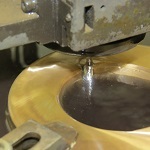 That depends completely on the size and thickness of the part to be cut, and the total length of the cut to be made. 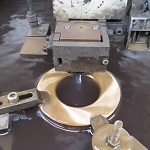 The type of material that is to be cut also plays a minor role. Typically, Wire EDM is a relatively slow, although extremely accurate, machining process. If the work pieces are relatively thin, say .250-.500 inches, many pieces may be stacked and cut at the same time, as long as the machine is only cutting in two axes. If there are tapering requirements, such as conical shapes or isometric radii, then only one piece can be cut at a time. However, since Wire EDM machines may run unattended, labor charges are kept to a minimum, and the same operator may run multiple machines. V W Broaching Service will estimate the most efficient methodology for cutting your parts when the estimate is given. V W Broaching, an ISO 9001:2015 certified company, is one of the largest specialty machine shops in the Midwest with an entire department devoted to wire EDM machining. Known in the industry for the high quality of our work, we stand behind what we do. For your wire EDM needs, contact us directly at 773-533-9000 or use our secure form below to speak to one of our knowledgeable staff members. There are no images available matching all of your filter selections. Please unselect at least one filter to display matched images. © 2015 - 2018. All rights reserved.